Shanghai Jiao Tong University (simplified Chinese: 上海交通大学; traditional Chinese: 上海交通大學; pinyin: Shànghǎi Jiāotōng Dàxué; abbreviated Jiao Da (交大) or SJTU), located in Shanghai, is one of the oldest and most influential universities in China. The university is under the jurisdiction of both the Ministry of Education and Shanghai Government. 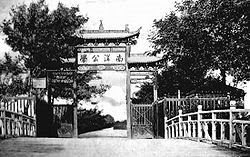 In 1896, Nanyang Public School was founded in Shanghai by an imperial edict issued by Guangxu Emperor, under the Business and Telegraphs Office of the imperial government. Four schools were established: the normal school, school of foreign studies, middle school and a high school. Sheng Xuanhuai, the proposer of the edict, became the first president and was regarded as the founder of the university. In 1904, the Ministry of Commerce took over the school and changed its name to Imperial Polytechnic College of the Commerce Ministry a year later. In 1906, the college went under the Ministry of Posts and Telegraphs and changed its name to Shanghai Industrial College of the Ministry of Posts and Telegraphs. When the Republic of China was founded, the college was run by the Ministry of Communications and changed its name once again to Government Institute of Technology of the Communications Ministry. In 1918, the republic government founded the School of Management and it became one of the oldest academic institutes. In 1920, the institute merged with two other colleges and changed its name to Nan Yang College of Chiao Tung. In the 1930s, it was known as the "Eastern MIT"due to its reputation of nurturing top engineers. In 1938, the Ministry of Education took over the university and renamed it National Chiao Tung University (the separate institution of National Chiao Tung University in Taiwan, is still known by name). In 1943, the graduate school was founded. At the end of the Chinese Civil War, in 1952, the new Communist government adopted a policy of creating Soviet-style specialized schools. Under this policy, some faculties of the university were incorporated into other universities. At the same time, engineering faculties from outside were absorbed to create a specialized engineering university. 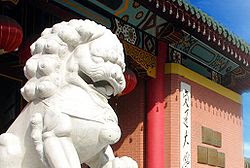 A bigger rearrangement came in 1956 for the school when the national government decided strategically to send a significant amount of its faculties to Xi'an to help create another top engineering school - Xi'an Jiaotong University in western Chinese province Shaanxi. Afterwards, the school was officially renamed Shanghai Jiao Tong University. Shanghai Second Medical University was merged into Shanghai Jiao Tong University on July 18, 2005, under the name Medical School of Shanghai Jiao Tong University. Since 2003, Shanghai Jiao Tong University has produced the Academic Ranking of World Universities which analyses the top universities in the world on quality of faculty (40%), research output (40%), quality of education (10%) and performance vs. size (10%).Its ranking is exclusively of research, mainly in the empirical sciences.